Wolves have recently returned to Sweden and Scandinavia since they were claimed extinct in the 1960’s. At first wolves were hunted for their thick winter fur. Then as cattle and sheep grazing became common, wolves were killed because they preyed on the herds of domestic animals. The wolves came to Scandinavia from Eurasia after the last ice age some 10,000 years ago, followed by humans, deer and other mammals. Since then wolves have been a part of the Scandinavian fauna as well as the cultural history. Man have since put a lot of effort into keeping the wolf population at a low level until we managed to eradicate the wolf population from Scandinavia completely by the end of the 1800’s. There has been many reasons for hunting wolves, but the main reason has been to prevent them for killing livestock. It was also profitable to hunt wolves for their warm fur. In 1647 a bounty on wolves was offered which further decimated the population. Despite the hunting there were probably thousands of wolves in Scandinavia during the 1700’s, but in 1789 a law was passed that allowed common people to hunt on their own land, something that had only been the right of the royalties and the nobility until then. This led to a decimation of the populations of deer. Moose became rare and roe deer could only be found in a few estates in Skåne in Southern Sweden. With a lack of prey the wolves probably began to take more livestock. That became a huge problem for farmers who had a couple of million cattle and sheep grazing in the forests during the Summer season. Many families were affected by the loss of livestock and when a wolfkilled nine children in Gysinge during 1920-21 the support to eradicate the wolf population was widespread. A massive hunt was launched and wolves were soon extinct in te Southern parts of Sweden. As an example 6790 wolves were killed in Sweden during the period of 1827-1839. The fastest decline in the population was between 1840-1860. The wolf population was pushed to the North until it was finally extinct. There may still have been a few wolves in the remote Northern mountain range, but wolves were claimed extinct in the 1960’s. In 1966 wolves were officially protected even if there we no wolves left in Scandinavia. In the early 1980’s three Wolves migrated from the Russian-Finnish population all the way to the county of Värmland in Southern Sweden close to the Norwegian border. These Wolves founded the new Wolf population and multiplied successfully into about 200 individuals. Since then a more Wolves have arrived naturally from the Russian-Finnish population, which has been an important contribution to the population. 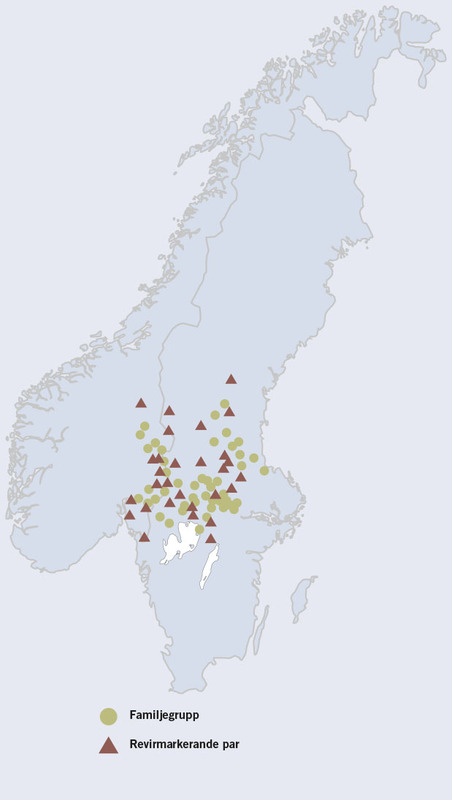 Today there are more than 300 Wolves in more than 40 different family groups, most of them in the Central parts of Sweden. The exact official figures are changing each year, but this page will give you a good insight into the current status of the wolves in Sweden and the Scandinavian Wolf population. How many wolves are there in Sweden and Scandinavia today? We are doing our best to keep this page updated but all figures are approximate. Wolves in Sweden and Norway are members of a joint cross-boundary Scandinavian wolf population. In both countries, the wolf population is monitored carefully by authorities, especially by tracking and collecting DNA from droppings during winter. During monitoring in winter 2017-2018, the Scandinavian wolf numbers were estimated to 430 (span 340-559), with the Swedish sub-population estimated to 340 (span 269-442). The smaller Norwegian population was counted directly in the field. A minimum of 25 cross-boundary wolves were counted, in addition to 65-68 individuals found only in Norway. The map shows family groups (dots) and pairs without pups (triangles). Wolves (back) are larger than coyotes (middle) and red foxes (front). What is the size of a wolf? Wolves reach up to 90 cm at shoulder. Males weigh 35 – 55 kg and females are on average 10 kg lighter. Scandinavian Grey Wolves are generally larger than wolves in Southern Europe although they are the same species. What do Scandinavian wolves look like? One often say that the typical Scandinavian wolf is grey, but at a closer look the fur is actually more a mix of white, yellowish and black. The chin and throat are almost always white. Unlike many hunting and husky dogs that may look a bit like wolves, the Scandinavian wolves are never white above the eyes. They often have black markings on legs, in the face, along their back and a dot halfway down the tail. The winter fur is a lot thicker than the summer fur. The front paws are larger than the hind paws, basically because the front part of the body is heavier and therefore needs larger paws. Wolves rarely become older than 12 years, but most wolves die at a young age, even during their first year. Only one out of ten wolves that are born are estimated to make it into adulthood and have it’s own litter. Do wolves live in packs? Wolves are social animals. They live in family groups, sometimes called packs. A family group typically consist of two parents and their pups. Most of the pups disperse (leave) the family after twelve months, before becoming sexually mature. Some pups may stay for more than one year. These elder pups may act as baby sits and remain close to the pups of the younger generation. What is a wolf territory? A Wolf couple keeps a distinct home territory where they typically stay for as long as they remain an intact couple. The territory is marked out accurately by urine, droppings, scratches and sound calls. They actively defend their territory against trespassing wolves. Fights between family members and trespassing wolves are not uncommon. Wolves may even get killed in such fights. The size of a Wolf territory may vary considerably. In Scandinavia such sizes have been calculated with the help of snow tracking and GPS collaring. A normal home territory measures 800 – 1 000 square kilometers which equals more than 140,000 football/soccer pitches. In extreme cases the home territory can reach up to 2 000 square kilometers, but they can also be as small as 400 square kilometers. Access to food and surrounding territories are some of the factors determining the size of the territory. Wolves may howl for many different reasons. They use many different type of calls to communicate within the family group. It can be short calls or longer series of howls, yipping, wining or even barking. Howls are also used to keep other wolves away from their territory. The most characteristic howls is probably when the pack is howling together. When do wolves have pups? The mating season occurs by mid-February. During this period the couple spends most of their time at their own away from their pups. The pups are born 63 days after the mating. The pups are born at the end of April or beginning of May. A litter may consist of 1-10 pups. The pups weigh 400 grams at birth and in late autumn they have already grown to about 35 kg’s. What is a wolf den? During the first weeks after the pups are born they are kept inside or close to a den in which the pups have the chance to hide if danger occurs. This den can be a hole dug out in sand or just some rocks with cavities. They do not use the den during the rest of the year. Wolves are carnivore and they prey on whatever is available and easiest to catch. In Central Sweden they mainly prey on Moose and Roedeer, but also Beavers, Hares, Badgers and Rodents. Further South they are more likely to prey on Roedeer, Red deer and Fallow deer. Certain individuals may occasionally take Sheep and Reindeer but these are often soon killed in protective hunting. The teeth are adapted to grip, drag, scratch and crush. The wolf can break bones of their prey to eat the marrow inside, they even break the thighbones of an adult moose. The wolf can survive in all types of habitat as long as there is enough food and they don’t get killed by man. Therefore they are often confined to live in forested areas where little or no humans are present. Wolves do not go in hibernation; they remain active the whole winter. Which enemies do wolves have? Most wolves are killed by humans, both during organized hunts and by poachers hunting wolves illegaly. Wolves are also killed by cars and trains. Some wolves are killed by other wolves in territorial fights. Do all dogs originate from wolves? Yes, all dogs are descended from wolves. Dogs and wolves are actually the same species. The dog is just the domesticated form of the gray wolf. In 1999, a study emphasized that while molecular genetic data seem to support the origin of dogs from wolves, dogs may have descended from a now extinct species of canid whose closest living relative was the wolf. In general, the domestic dog is an extremely close relative of the grey wolf, from which it differs by only ~0.04% in nuclear coding-DNA sequence, and no dog mitochondrial DNA sequences have been found that show closer kinship to other canid species. Wolves are the largest members of the Canidae family, which includes domestic dog, dingo, coyote, African hunting dog, several kinds of jackals and several types of foxes. Wolves have an outstanding sense of smell with about 200 million scent cells compared with humans that have only about 5 million. Wolves are good swimmers. At several occasions they have been seen swimming out to islands in lakes, and even across large rapid rivers during winter. The wolf’s jaw force is sufficient to break open and crush bones with only a few bites. They are capable of a jaw pressure of up to 105 kilograms per square centimeter (1,500 pounds per square inch). This is about twice the jaw pressure of a German shepherd dog. The jaws themselves are massive, bearing 42 teeth specialized for stabbing, shearing, and crunching bones. Their jaws also open farther than those of a dog. Wolves constantly move around their territory and can easily cover 40-50 kilometers in a day. Wolves howl to each other and to other Wolves, simply as a way of communication. Listen to our recordings of howling wolves here! Hearing a Wolf howl in a dark forest is a big experience, join Sweden’s most successful Wolf howling tours. Wolves would not make good guard dogs because they are afraid of humans and would hide from visitors rather than bark at them. Modern research shows that labeling a wolf “alpha” or “omega” is misleading because “alpha” wolves are simply parent wolves. Using “alpha” terminology falsely suggests a rigidly forced permanent social structure. Dire wolves (canis dirus) were prehistoric wolves that lived about two million years ago. Now extinct, they hunted prey as large as woolly mammoths. A wolf can run about 30 km (20 miles) per hour, and up to 60 km (40 miles) per hour when necessary, but only for a minute or two. They can trot around 8km (5 miles) per hour and can travel all day at this speed. It is believed that the last wolf in England was killed in 1500. In 1770, Ireland’s last wolf was killed. The Japanese word for wolf means “great god”.